Designer’s Ink Graphic & Building Designs LLC, is making its mark on the computer aided drafting industry across the globe. 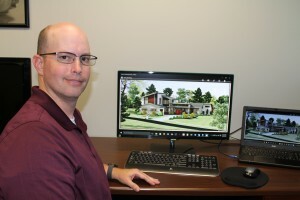 With projects ranging from modest home remodels in Stillwater to large-scale commercial projects in the Bahamas and Angola, Africa, company owner/designer Jeff Dillon is giving design ideas new dimension using Chief Architect Premier X8, a professional 3D building design software. In addition to bringing ideas to life with high-quality 3D renderings and walk-through videos, Chief Architect Premier X8 generates a materials list for builders and produces industry standard construction documents that include site plans, floor plans, section details, electrical plans, roof layouts, schedules and both interior and exterior elevations. 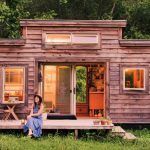 “Knowing all of these elements allows a builder to make a more accurate estimate of the project. There is a tremendous cost savings due to fewer change orders during construction. Clients know exactly what they are getting and builders know exactly what they are building,” Dillon said. Dillon, the son of a building contractor, started Designer’s Ink in 1993 after designing houses as a hobby, but his love for design began when he was 14 years old. His brother had taken a drafting class in high school. When the year was over, he threw his drafting textbook in the trash. While the subject wasn’t a hit with one Dillon boy, it was for another. The younger Dillon rescued the textbook and read it from cover to cover in no time. By the time he was 16, he’d designed his first house. In 1992 Dillon came to Oklahoma State University to pursue a degree in architecture. After his first year on campus he had the opportunity to assist with the reconstruction of a local crime scene. That experience ended up being the end of one career path and the beginning of another. Dillon joined the Stillwater Police Department full-time in 1994. He continued to work for clients in his spare time, teaching himself Chief Architect Premier along the way. Through the years business for Designer’s Ink continued to grow. With retirement inching closer, Dillon recently made the decision to move his company from his home to the Meridian Technology Center for Business Development. Along with the new address, Dillon added another full-time designer to the company, Kevin Walthall. To date Designer’s Ink has served clients in 17 states and across two continents. “Clients from all over the world find us on our website and ask us to design their projects.” Dillon said. Twice Dillon’s designs have been featured on the Chief Architect website, and he frequently assists other program users on the ins-and-outs of the software. Dillon isn’t sure what is next for his company, but he knows he wants to remain true to his roots. By having offices at Meridian, it is the perfect opportunity to start hiring graduates from the Architectural Drafting Program as the company continues to grow. The Meridian Technology Center for Business Development assists in the business growth and development process by providing essential space and services for business incubation. From management guidance to technical assistance and consulting tailored to young, growing companies, the Center encourages development by working closely with clients on a progression plan that has measurable goals to assist the company in being self-sustaining within a designated time period. Incubator clients like Dillon and Designer’s Ink also have access to many infrastructure needs of new companies, such as high-quality office and lab space, meeting rooms and a physical address. Companies can be residential or virtual tenants of the Center for Business Development. Residential tenants access services and rent dedicated office or lab space for up to three years. Virtual tenants access services but do not rent space. Clients can move easily between both tenant types depending on their business needs and situation. 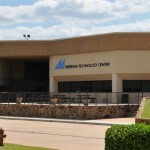 For more information on services available through the Meridian Technology Center for Business Development visit meridiantech.edu/entrepreneurs or contact the Center for Business Development by phone at (405) 377-2220 or toll-free at (888) 607-2509. To learn more about Designers Ink visit designersink.us.